The Chicago Cubs. Loveable losers of baseball. They have a great ballpark, albeit kinda rundown, and some great players over the years. but never a mascot. Until now. 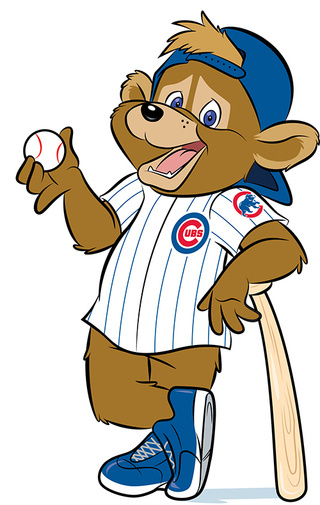 The Chi-town Cubs unveiled their first ever mascot yesterday. Ladies and gentlemen, Clark the Cub. Cute, huh? I’m not sure what “cute” has to do with being a MLB mascot. The Philly Phanatic is some sort of tongue-lashing beast, The San Diego Chicken is a fearsome warrior, and Mr. Met suffers from hydrocephalus. None of them are cute. So rightfully so, reaction among baseball fans has been clear and absolute: they hate the thing. And so they set out to destroy it. Deadspin.com started a contest to see who could deface the mascot in the funniest way, and trust me, there are many. Well, one stood, um , not head and shoulders, exactly, above the others, and was the clear winner. In fact, some local media was covering the mascot and somehow (and I really want to know how and who got fired) one of the Deadspin versions aired instead of the real one. Let’s watch and see how professional newsreaders handle the unexpected. He’s friendly, he loves kids, he doesn’t wear pants. You can’t script this, folks. In other news, Florida’s Billy the Marlin has been arrested for soliciting a prostitute. That’s the dumbest thing I’ve ever seen. How does it add any value at all? Will it help the team win? Will it attract more fans? Does it make the world a better place? Why did they waste money (and it was probably a lot) to come up with something so idiotic. BTW, where do you weigh in on the Cleveland Indians mascot? I say leave Chief Knockahoma alone, and let the Redskins have their name too. Those are not only products of a different time, but were products of a different time. But I think the bottom line is that they were never meant to be racist, they were meant as tributes. Exactly. No way malice was ever intended I’m sure.